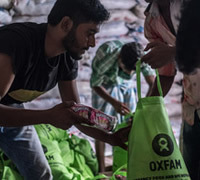 Oxfam aims to help create long-term sustainable refugee camps in Bangladesh. Hundreds of thousands of Rohingya people have fled Myanmar for Bangladesh and are now living in refugee camps. Oxfam is providing fresh food vouchers, has set up an extensive sewage infrastructure and provided solar lamps to thousands of families. We hope this will help women feel safer at night. Oxfam is responding now. £35 could provide 7 families with water for a week. £60 could provide 60 people with food for a week (includes rice, lentils, oil, salt and sugar). 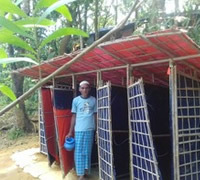 £100 could provide 4 families with a toilet/latrine.